A bruised heel is also known as a fat pad contusion or Policeman’s Heel. It is a common cause of pain under the heel caused by overuse. Symptoms consist of pain under the heel bone (Calcaneus). Pain usually comes on gradually over time, but canbe brought on instantly from jumping onto the heels. You will find walking or running will be uncomfortable or painful. However, running on your toes or the balls of your feet will not be painful. Often athletes will put up with mild symptoms for some time before pain prevents them from training. Pressing in under the heel may trigger pain or be uncomfortable. Walking or running will make symptoms worse, whilst complete rest from aggravating activities reduces pain. 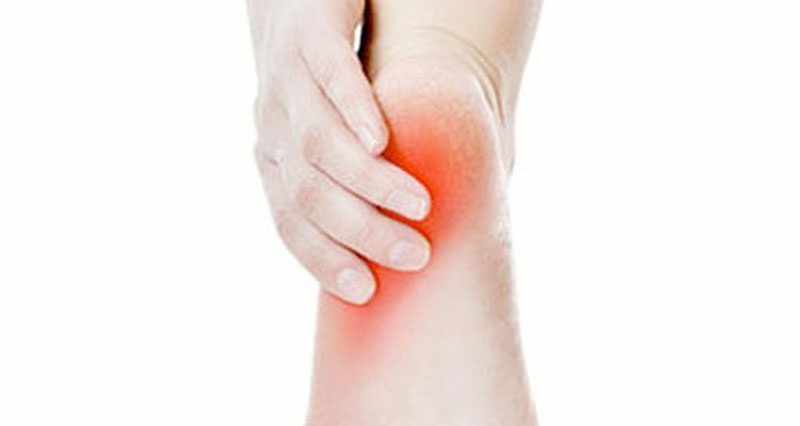 Symptoms of a bruised heel bone are similar to those of plantar fasciitis, another common cause of heel pain. However, a bruised heel is not usually worse first thing in the morning. Also, pain is unlikely to radiate forwards into the arch of the foot as plantar fasciitis can. Another key difference is that a bruised heel often improves with rest and gets gradually worse with walking. But plantar fasciitis is often worse first thing in the morning, and improves with walking. This is because the tissues warm up and stretch. 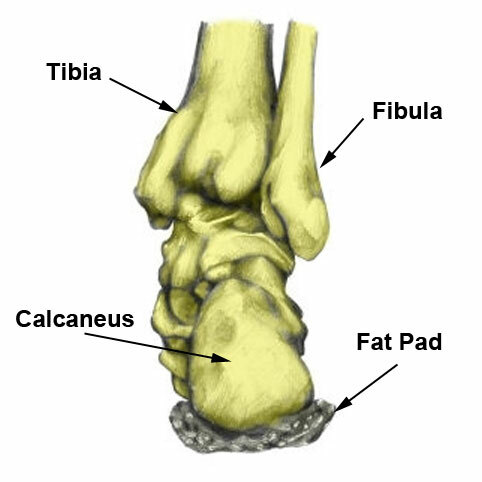 The heel bone, or calcaneus bone as it is called, is protected by a pad of fatty tissue. This is composed of an elastic fibrous tissue septa (Latin for something that encloses) separating closely packed fat cells. The fat pad acts as a shock absorber for the heel protecting the calcaneus or heel bone. Repetitive impact to the heel causes the fat pad to flatten and be displaced sideways. This leaves a thinner protective layer, therefore resulting in brusing to the heel bone. If you wear hard, flat shoes with little or no cushioning. Running too far too soon. Increase mileage by 10% per week. Make sure you have appropriate footwear which is in good condition. Most running shoes are good for 400 miles before the midsole begins to loose its cushioning. If you catch a bruised heel early and rest then it should recover quite quickly, usually within a few days. However, if the early onset of pain is ignored it can be very difficult to treat. This is due to the fat pad becoming damaged beyond easy repair. What can the athlete do? Rest! Rest until there is no more pain. This is the most important because continuing to walk or run will not allow it to heal. Rest means complete rest. There is no point stopping running for a week if you put up scaffolding for a living. Switch to cycling, swimming or any non-weight bearing activity. Wear a shock-absorbing/cushioning heel pad or insole in your shoes. This is especially important if you have to wear a hard, flat, ‘sensible’ shoes to work. Insoles or heel pads should be worn in both shoes to avoid leg length differences. This is likely to lead to further injury to the hips and lower back. Tape your heel. A simple heel taping technique will compress the fat pad and provide increased cushioning and protection. Wear soft trainers with lots of cushioning in the midsole. They may not look good in the office but will make a big difference to your healing time. Replace running shoes if they are old. Read more about choosing running shoes. Prevention is always the best cure so acting early with a fat pad contusion and resting is most important. A sports injury professional will confirm the diagnosis and help identify any possible causes. For example if you have biomechanical problems such as overpronation or oversupination. Your therapist may do a gait analysis to assess how the foot moves during walking and running. 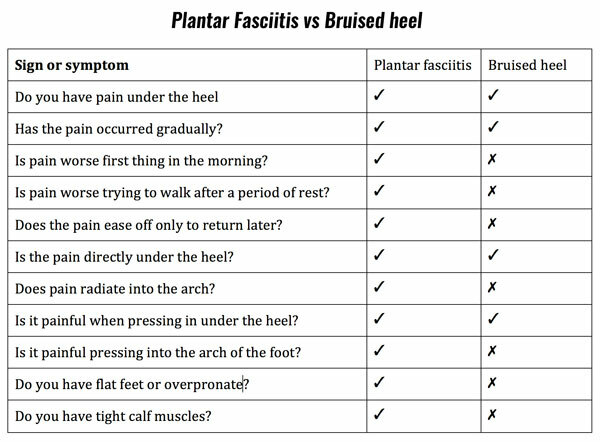 However, for a bruised heel, gait is not normally a contributing factor. They will advise on insoles, orthotics or heel pads to protect the fat pad in the heel. They may tape your heel to provide additional protection and support whilst it is healing. In addition a professional therapist should be able to advise on training errors. The aim of taping for a bruised heel is to compress the soft tissue under the heel. This increases the natural cushioning of the foot and protect the heel from impact. A simple roll of 2.5cm/1-inch non-stretch zinc oxide tape is all that is needed. Then repeat the first anchor strip over the top. Continue alternating support strips and anchor strips until most of the heel is covered. Spears IR, Miller-Young JE, Sharma J et al. The potential influence of the heel counter on internal stress during static standing: a combined finite element and positional MRI investigation. J Biomech 2007;40(12):2774–80.